We were featured in the Springfield Business Journal in 2016. Read the article below and check out the photo gallery and the original at www.sbj.net. Roofing work is risky business. According to the U.S. Bureau of Labor Statistics, roofers are three times more likely to experience fatalities on the job than those in other construction trades. And falls account for 75 percent of work-related deaths in the roofing industry. To that end, Queen City Roofing & Contracting Co. officials have emphasized safety standards and training. They’ve backed up the talk with over $250,000 invested in safety equipment the last few years, says owner Larry Stock. “It helps distinguish our company,” he says. Stock points to Queen City Roofing’s recent run without a major accident and its quality score in determining workers’ compensation insurance rates. The National Council of Compensation Insurers calculates an experience modification rating for insured companies, and he says QCR is well below an at-risk score above 1. “There aren’t a whole lot of roofers with a 0.69 modification factor,” Stock says. Employee Brian Draper is on board. Stock charged him with leading the team in safety education and other professional development matters. Two years later, Draper on Nov. 1 became the National Roofing Contractors Association’s first certified ProForeman. “We’re an old-line company. We haven’t had a lot of guys be the first in the country on anything,” Stack says. NRCA University Vice President Amy Staska says Draper remains the lone certificate holder, but other foremen are getting close to completing the 80-hour leadership program. “Without the training, all the money spent on safety equipment won’t help you at all. You might buy all this stuff, and it might sit in the corner,” says Draper, a foreman who Stock promoted to superintendent during his studies. The work, including webinars and traveling classes, is designed to shift foremen’s perspectives from serving as roofing installation managers to company leaders. The six areas emphasized are general education, roofing technology, construction/business practices, leadership, safety and training others. Stock has seen it all in the industry. He began working for QCR as a laborer in 1979 and bought the business 20 years later. When he started, there were no computers, no fax machines and only a handful of roofing systems on the market. Now, there’s of upwards of 100 systems, with such names as thermoplastic membrane, synthetic rubber and modified bitumen. With industry advancements in materials and technologies has come a change in reputation. Steve Arnold, sheet metal superintendent, shears material for projects in the company’s 90-mile coverage area. The new complexities factor in to increasing employment interests. The BLS projects 13 percent growth in roofing jobs by 2024, a faster pace than the average industry. For jobs that require no formal education and moderate on-the-job training, the median annual pay was $35,760 last year. QCR General Manager Michael Katrosh says project work is a 60-40 split between new construction and roofing repairs. Projects range from a $5,000 flashing repair to a $2 million metal panel new construction. 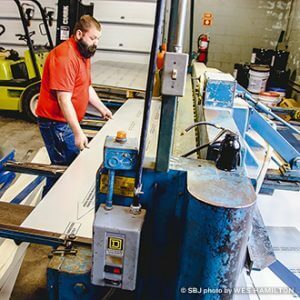 Of the 75 jobs completed last year, QCR finished with $8 million in revenue, including sheet metal division work. Two large jobs on the outskirts of its 90-mile coverage area wrapped up in Kansas and Arkansas. QCR crews installed the membrane roofing, sheet metal and exterior metal panel on the Pittsburg State University performing arts center and finished work on Fayetteville High School that was phased over three years. Around town, QCR has covered buildings for 3M, Evangel University, Bill Beal Co. and the Springfield Cardinals. While 2015 revenue was up 7.5 percent on paper, QCR officials say the year was within striking distance of the company’s record $8.9 million in 2012 sales. Of course, that was the year following Joplin’s tornado, and QCR was chosen for work on Mercy’s temporary hospital, on top of the uptick in rebuilding jobs. Work in 2013 dipped by a double-digit percentage to more normal levels. “We’ve been trending up in ’14 and ’15,” Stock says. On the repair side, Stock says the company last year performed over $1 million in reroofing projects on work that wasn’t even 3 years old. He says that’s a caution to the industry and to consumers. Stock says repairs are due to poor design, aging, standing water or infiltration and other issues with windows or walls. He says it just takes a watchful eye to catch problems before it’s too late. “People tend to have their cars looked at frequently, but once the roof is on, they tend to ignore it,” he says. © 2016 Springfield Business Journal. All rights reserved.